I like a unique and slightly experimental concept like this. The experiment is similar in spirit to My Dinner With Andre, the 1981 film by beloved French filmmaker Louis Malle, in which the entire film is spent at a restaurant listening to two friends discuss their lives. 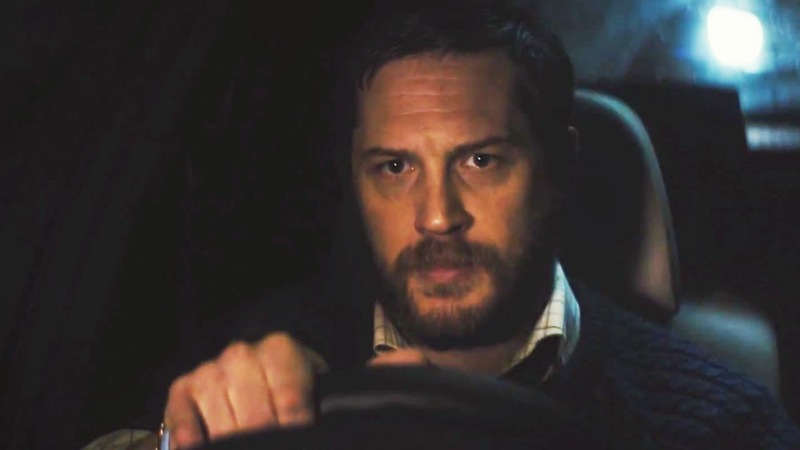 Here, however, we are essentially a passenger witnessing, one man, Ivan Locke (Tom Hardy) as he drives down the M6 motorway to London. 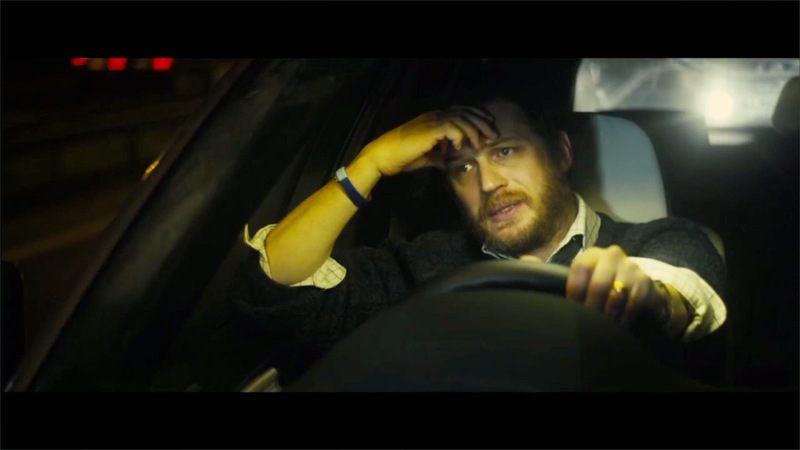 The entirety of the film is spent watching Locke drive his car. Through a series of phone calls we see him start to unravel. Although we hear several voices over the phone, the only actor we actually see is Tom Hardy, and he's getting a healthy amount of acclaim for his efforts, although admittedly not as much as he deserves. We are spending an hour and a half car ride with Locke on the worst night of his life. After 15 years of happy marriage, and devotion to his family he has to admit that he had an affair with another woman and that the woman is giving birth to his child. He would have told his wife before but the woman's water broke early and he had to leave rather suddenly. This all happens on the evening before an important day in Locke's career. The following morning he is to lead the construction of the largest concrete building ever built in Europe outside of nuclear military operations. The president of the company, from Chicago, and his boss, Gareth, are all anticipating this momentous event. Nevertheless, he has made up his mind to travel to London to be there for the child that's about to be born. 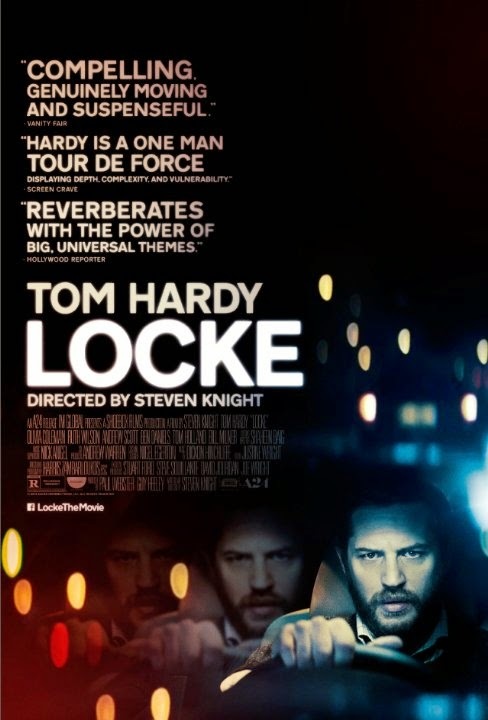 Over the course of the numerous phone calls Locke takes on his drive, the complexity of the situation unfolds. He is going to lose his job for abandoning the biggest project his company has ever put together. He's also desperately trying to hang on to his marriage, all while trying to take responsibility for a mistake he made. Along the way Locke speaks to his empty back seat as though his long dead father were there watching him struggle. In these conversations, we learn Locke himself was born outside of marriage, and his father never made time for him. Because of this we understand his mental state and why he is determined to do the right thing after this mistake. He barely knows the woman, and openly tells her he can't hate or love her considering the circumstances. He tries to assure his wife that it was one time, but as we will know, one mistake can change a person's whole world. He is, despite his big, unforgivable mistake a man of character. He's willing to admit that he's done wrong. He is trying to own up to his mistakes, and he is willing to face the consequences as well. He is determined to make up for his mistakes in whatever way he can, and even keeps helping the building project despite being fired. It is after all his project, as much as the baby is his baby, and he's going to take responsibility for them. Obviously there are loaded consequences here, but he is dead set on completing his journey. In a way his hatred for his father turns to understanding as he continues to wrestle with his mistake and his decision. The tough questions we wrestle with along the way is whether Locke's decision is the right one. We know he's probably making the right choice, and doing the right thing, but after seeing the consequences we can't help but wonder. He realizes that in accepting responsibility for his mistake he is breaking his own family and negatively affecting them as well as his co-workers, as everyone scrambles to make up for his absence. We get to the point where we just can't be sure who Locke is anymore, or who will be going forward. Much has been made about the way the film was shot. It's reminiscent of the best scene from Abbas Kirostami's 2012 film Like Someone In Love, in which the main character rides in a taxi around Tokyo at night listening to voice messages on her phone, each one making it harder for her to hold back tears. Here, the headlights, street lights, and reflections all begin to superimpose over Locke's face showing us the breakdown of his psyche. What was once clear lights, despite the darkness of evening, have been defocused into incomprehensible glowing orbs, much like what's left of the man Locke used to be. Locke subverts expectation in every way. Against all odds, a movie that tells instead of shows just works. I can only credit the writing and Tom Hardy. It's such a simple film about a very complex situation. Many may be wary of a story that takes place entirely in a car, but I assure you it's absolutely riveting. It's an honest, engaging film, and the performance Tom Hardy gives is one of the best you'll see all year.